In response to viral infection, many organisms mount a remarkable defense known as the immune response. This response to viral infection consists of an innate, or nonspecific component, and an adaptive, or specific defense. The innate response is considered the first line of immune defense because it is active even before infection begins. In fact, many viral infections are halted by the innate immune system, which responds very quickly – within minutes to hours after infection. A key property of the innate immune system is the ability to recognize viruses as ‘foreign’. Viral proteins and nucleic acids are distinguished from cellular counterparts by cellular proteins called pattern recognition receptors (illustrated). These are proteins present either in the cell cytoplasm or on cellular membranes, where they detect viral components. For example, the cytoplasmic protein RIG-I detects double-stranded RNA (dsRNA) or single-stranded RNA (ssRNA) with a 5′-triphosphate. These types of RNAs are usually not found in the cytoplasm of unifected cells; rather they are typically products of viral replication. 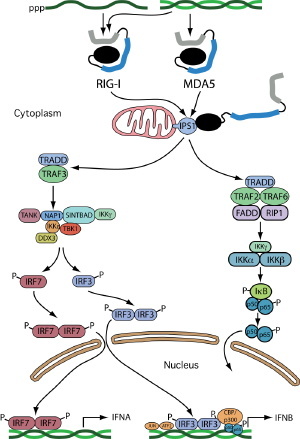 When RIG-I binds these viral RNAs, a series of reactions occur which lead to the synthesis of cytokines, the primary output of the innate defense system. Other detectors of viruses are the membrane-bound toll-like receptors (TLRs), which sense viral glycoproteins, dsRNA, ssRNA, and the sequence CpG in viral DNA. Engagement of TLRs by these virus-specific ligands also leads to the synthesis of cytokines, albeit by different pathways. The presence of cytokines in the blood is typically one of the earliest indications that the host has been infected with a virus. Over 80 known cytokines are secreted by infected cells. The first that are produced after viral infection include interferon-α and -β (IFN-α, IFN-β), tumor necrosis factor alpha (TNF-α), interleukin-6 (IL-6), IL-12, and IFN-γ. Cytokines function locally by binding receptors on other cells. For example, IFN produced by infected cells engages receptors on neighboring cells. Those cells then produce hundreds of cellular proteins which have antiviral activities. When cytokines enter the circulation, they elicit symptoms typical of many viral infections, including fever, sleepiness, lethargy, muscle pain, loss of appetite, and nausea. Another key component of the innate response are the so-called sentinel cells: dendritic cells and macrophages present in peripheral compartments such as skin and mucosal surfaces. Sentinel cells patrol the body, seeking signs of infection. Dendritic cells bind cytokines produced by virus-infected cells, and also take up viral proteins released from dying virus-infected cells. They respond by producing more cytokines to amplify the original response. In many viral infections, the early action of cytokines produced by infected cells and dendritic cells is sufficient to eliminate the pathogen. If innate defenses are overwhelmed and virus replication continues unabated, then the second-line defenses are mobilized to ensure host survival. These comprise the adaptive immune response – antibodies and immune cells. Days to weeks are required to mount an adaptive immune response that is specifically tailored to the infecting virus. The innate response therefore serves as a crucial rapid response that provides sufficient time for the activation of the adaptive immune system. This info is just so awesome. Thanks so much for taking the time to put it up and do it in simple, short bits. While it might be over the head of some folks, lots of people have taken biochem and other science courses, even though we might have forgotten a lot of it. Your posts bring it back and I remember again…amazingly enough! Gotta love those cytokines. digestible pieces. That way we can cover more, and it's easy to read. questions. And they can always read more in my textbook! When I first started studying reovirus as a postdoc, I was absolutely blown away when I began to look into the transcription “strategy” of reovirus: a transcriptase complex poised at each of the icosahedral fivefold axes of the viral core, which protects the dsRNA genome, never exposing the dsRNA to the cytoplasm. The mRNA transcripts are extruded from the viral core and emerge complete with a 5' cap! What a beautiful, little (and sneaky) machine. Are there formal similarities between how innate defenses recognize foreign viruses and how “meaning” is extracted from written language? Brilliant strategy, it shows how selection pressures can force the evolution of amazing mechanisms. There are probably some similarities, except that language (in my primitive view) is more complex. Innate recognition seems to be based on a few relatively simple 'patterns' in molecules. Quick question, why doesn’t tRNA activate the dsRNA antiviral response? Thank you for the simplicity. It is much appreciated, even to an educated crowd…nothin’ beats breakin’ it down. Quick question – what is the principle component of immune system responsible for “initial” response to virally infected cells. My daughter recently has been rendered Paralyzed in her left arm due to an unknown virus that apparently got into her spinal cord during or after an asthmatic episode. It has been explained to us to be a poliomyelitis type virus because of a sequence of occurrences that allowed it to slip passed sentinel cells and through her blood line barrier. Do you know much about these types of viruses or what it could have been. The California Institute of health is running labs but at this point everything has come back negative. She has been a perfectly healthy child up to now and this is such a freak occurrence that I would hope we can sustain from happening to another child. any thoughts? By ‘initial’ I take it you mean the innate immune response. NK cells are considered part of the innate immune response, but their ligands are MHC class I molecules. She tested negative to enterovirus lab. The only thing positive in her labs is mycoplasma pneumonia and high titers of IgE.